The Pacsafe RFIDsafe TEC Trifold Wallet is an ultra slim tri-fold wallet that is lightweight and functional with a double snap closure to keep everything in place. The slim, heat-welded design has a soft microfiber lining and a smooth finish that allows you to comfortably slide it into your pocket. It features RFIDsafe blocking material to protect your personal information held on credit cards from electronic scanners, to keep you protected and organised every day. The Pacsafe RFIDsafe TEC Trifold Wallet - Navy has many exciting features for users of all types. It's one of FactoryOutletStore's best selling . FactoryOutletStore stocks a full line of accessories like 4 Dial Retractable Cable Lock and Combination Lock for the Pacsafe RFIDsafe TEC Trifold Wallet - Navy. 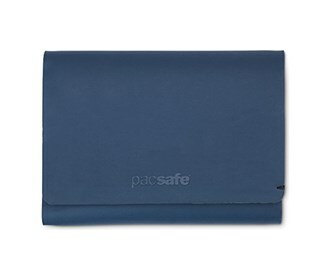 The Pacsafe RFIDsafe TEC Trifold Wallet - Navy is sold as a Brand New Unopened Item.